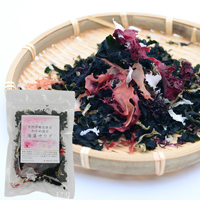 A sea vegetable assortment of domestic seaweed. Mixed natural seaweed from Iseshima. All you need is to dehydrate the dried seaweed salad and mix it with your favorite vegetables and dressing. This seaweed salad is so easy to make, versatile and very healthy.